You are packing up the car and getting away for a week or maybe a few. You have all the right gear – the tent, the tennis set, maybe even the kayak for some lazy afternoon paddling. The thing is you have an issue of space. You can choose to leave your children behind and cram as much on the back seat as possible – or you can get yourself a rooftop cargo carrier. It is likely that one choice more than the other will lead to a more fulfilled holiday – and a future, happy life with your spouse! Buying the roof rack for your car is no easy matter. There is an absolute avalanche of models available to buy in store or online – and it will feel impossible to know where to begin. This guide is essential to your rooftop cargo carrier purchase, as we introduce you to the different types of rooftop cargo carriers and help you to find out which one is more likely to fulfil your needs. There is such a lot of choice out there – being forced to choose one to recommend over others is difficult. However, there is one standout rooftop cargo carrier that is worth singling out. The Yakima Skybox Carbonite Cargo Box comes in at a reasonable price but is packed with features. The reason I like it so much – the amount of space offered without it looking too bulky on the top of my car. With 16 cubic feet of storage, this is more than enough for me and the family – and it was easy to install and to access – with its dual sided opening. Yakima is a top brand and comes with bags of history of high quality product – sometimes you just must go with a proven success story. And if you want more proof, there are over 300 reviews on the Amazon with an average of 4.5 stars to back me up. There are three types of cargo carriers, these include the cargo boxes, cargo bags, and cargo baskets. Let’s take you through these types of cargo carriers to help you decide which might be your best option. Cargo boxes come in various sizes and finishes – and you can even get some that are lockable. The obvious feature of a cargo box is that you are getting a solid sided box that attaches to the top of your car. You can buy cargo boxes that are roof mounted models or hitch mounted models. Cargo boxes require you to have a rack system in place too. 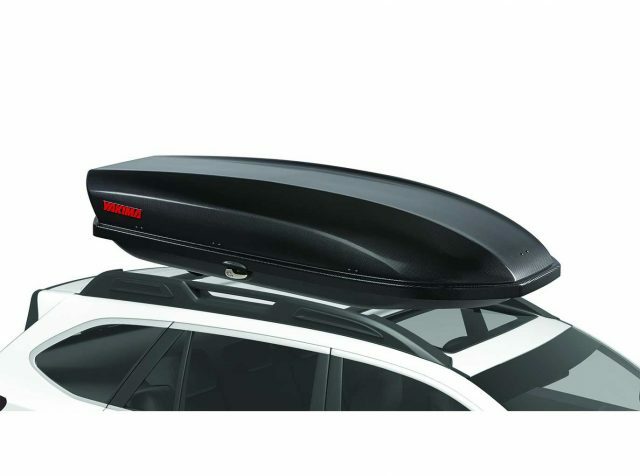 Roof mounted cargo boxes are an ideal way to increase the capacity of your car. It leaves your trunk space easily accessible whilst giving you a secure place to store important kit. Cargo Bags are pretty similar to Cargo Boxes, except they come in fabric, with soft sides – rather than the bulky, hard sided box. The amount of space you get with a cargo bag is much less than a cargo box. However, they are much easier to mount on your car and easy to stow when not in use. They also come at a fraction of the cost of cargo boxes. The cargo bags are sturdy and effective protection against the fiercest of elements. However, it is still worth giving your things an extra layer of protection by covering them in plastic bags too. A cargo basket is an extension to your roof rack. It is like a narrow sided, super-sized shopping basket attached to the top of your car. To attach a cargo basket, you will need a rack system in place. Your cargo basket can also house your cargo bags much more simply. You will secure your kit to the cargo basket using stretchy cargo net and hooks. Cargo baskets, with the net, give you more flexibility in the size and shape of cargo that you carry – but does not offer the same sort of protection from the elements as the boxes and the bags. You are likely going to need a rack system, no matter what other rooftop cargo carrier you opt to purchase. 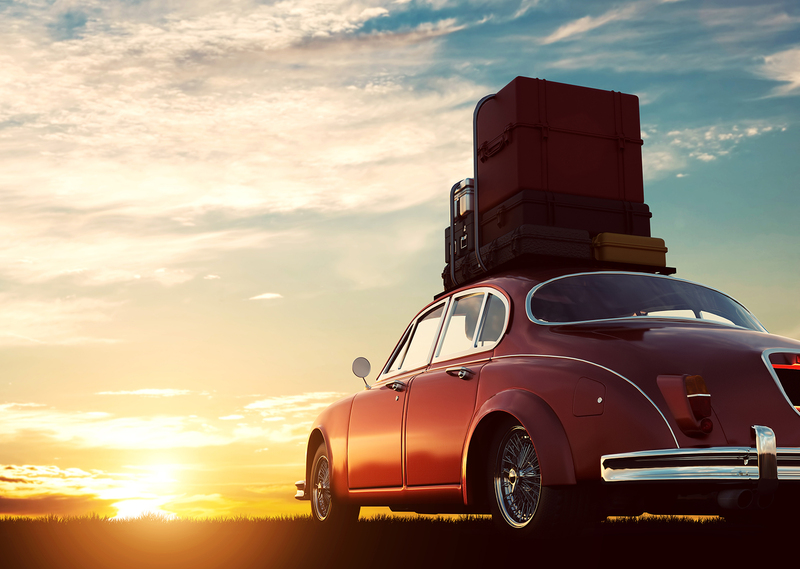 It is essentially the connection between your car and whatever you want to carry on top of your car. A rack system offers you flexibility to carry a range of objects, including bikes, skis and snowboards, surfboards, canoes and kayaks, as well as being a mount for your cargo box, bag or basket. Choosing an appropriate rack system requires some knowledge of what you are hoping to carry. If you are going to carry expensive and large equipment, then you need heavy-duty square crossbars. However, if it is just going to carry some bikes – then you have more freedom to buy any rack system. Most rack systems will come with the accessories needed to fit to your car. Most will also match with a range of bars – whether they are square, round, aero or elliptical bars. Knowing what you want to carry is sometimes the better starting point – then you can buy a rack that is specific to your equipment, whether it is bikes or boats. It is also a good idea to research the rack system that is most appropriate to your vehicles. There are essentially four categories of vehicle – naked roof, factory installed raised side rails, factory installed flat tracks and factory installed roof racks with cross bars. With a naked roof you will need to purchase a fit kit, foot pack and crossbars – as you will need to create the complete rack system. Other options will require a mixture of fit kit, foot pack and crossbars – depending on what is already attached to the top of the car. The major choice you face is the type of crossbar you purchase. When choosing you will be interested in shape, wind noise, drag and the material used for construction. The ones you choose will impact what you can carry and the price you will pay. When buying your cargo carrier there are many factors you will need to consider. Here are some of the important features to consider when buying a cargo carrier. One of the most important things to consider is the size of your rooftop cargo carrier – how much will it allow you to carry on the top of your car? The normal range is between 10 to 25 cubic feet. The size of your cargo carrier will obviously depend on the size of your car and what it can handle. However, you also need to think about the sort of items you hope to fit into your cargo carrier and how secure they need to be. The design of your cargo carrier is more than just the look of the cargo carrier. Obviously, you want the aesthetics – but you also want your car to maintain its aerodynamic qualities too. Something too square will create a drag on your car and cause you to spend more money in fuel. The design can also impact on the amount of wind noise you experience. The lower and longer the rooftop cargo carrier – the more aerodynamic it will be. However, the length and height will also practically impact on the items you can store. A cargo carrier is a substantial investment. You want to know that your purchase will last a long time. Value for money is cited as one of the most important factors in making a decision – but this does not necessarily mean the cheapest. You are looking for a material that will maintain the carriers structure, as well as continuing to protect against adverse weather conditions. You need to choose a cargo carrier that fits with the fixtures already attached to your car and to the objects that you want to carry. There are round and square shaped cargo carriers – there are those that are aerodynamic – and those that will fit perfectly to your factory bars. Do some research before purchase to make sure that your cargo carrier is compatible with your needs. Although not the most important feature, you are more likely to be influenced by a cargo carrier that is easy to assemble. A complicated assembly will limit the time you can be holidaying and make the cargo carrier inflexible – who wants to keep taking it on and off the roof when its that hard? Look for the term user-friendly and for those that can be assembled without requiring tools. Another factor is accessibility – you need to be able to open them from different positions – so that you have access to all the items in the carrier. Those that only open from the front or the rear make it necessary for you to unpack everything to get to the thing at the back of the box! You should realistically opt for a cargo carrier that comes with a security lock. You will want the knowledge and confidence that your possessions are safe when you leave your car unattended. Having a good lock is one way of keeping your things secure, but so is buying a carrier where the material is strong enough to not be ripped or otherwise compromised. There are a lot of companies who manufacture cargo carrier systems – though not all manufacturers create cargo carriers of equal quality. The right brand for you will likely depend on the type and quality of features, the price and the experience of others who have made similar purchases. Here is a list of the best brands for cargo carriers and what makes them stand out amongst the rest of the market. Founded in Sweden in 1942, Thule was the first company in the world to make it possible for car owners to transport bulky equipment – at first the intended audience was those with large sports equipment. However, in recent years, Thule has extended its range to include cargo carriers for different purposes and different models of cars. Yakima is a large brand, but this was not always the case. It started small in a machine shop in Yakima, Washington. Now it is considered one of the best brands available – either purchased under the name Yakima or under the name of Whispbar and Prorack. Yakima is most known for innovation in design – understanding how to adapt the cargo carriers for modern cars and modern usage. With just 10 years of market experience, Malone is one of the fastest growing cargo carrier manufacturers coming out of the US. The company has stores across North America, Australia and Europe. Malone is best known for being the first company to offer load assist modules for single person handling. If you are travelling alone, this could be the discerning feature that makes you choose Malone. US based SportRack offers a range of boxes, bags, racks and baskets to increase the capacity of your car. As the name of the brand suggests, this company specialises in snow sport carriers and water sport carriers. The company brand promotes quality products for those wishing to live an active lifestyle. The name Inno is taken from the word “innovation” and represents the brands desire to strive for the development of the best cargo carriers on eh market. The basic concept of the brand is to provide innovative designs that are easy to use and show a sense of originality. The range of cargo boxes is huge – there is definitely no shortage of choice. Each of the major brands have a box worthy of choice. Here are the best cargo boxes of the bunch. Easy to open – with access from both sides and a grp-friendly handle and supporting lid lifters. Sits forward on the car, so you will have full access to your trunk too. It comes in a range of sizes – up to 21 cubic feet – so there is every chance you will find one to fit your car. It is much cheaper than your average box! Tyger is proud to meet or exceed expected standards for aftermarket auto parts.